In Chiarano we offer for sale, in the central area, a three-bedroom apartment on the second and last floor of a condominium. The property of 125 square meters net walkable (155 sqm commercial) consists of an entrance hall on large living area with kitchenette, hallway, triple room with private bathroom, double bedroom, single bedroom and bathroom. 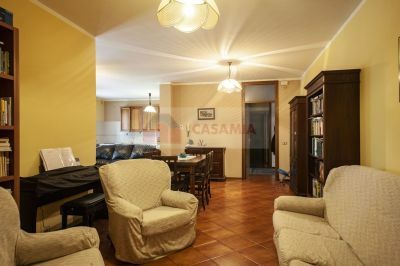 In the basement there is a garage of 39 sqm. The apartment is very bright, in good maintenance conditions and is habitable immediately. The finishes are of good quality. It is located in a strategic position due to its proximity to the post offices and all the services. Ref. 201 Chiarano 3 rooms for sale.